This one would be a great Father's day gift (if the receiver LOVES candy.) 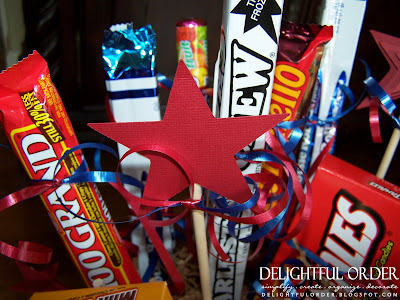 It would also make for a great graduation gift or Fourth of July party piece. When creating these bouquets (for the lady) or arrangements (for the man), they can be in any container you choose. That's the beauty of making your own. I found this 'Coleman" 1 gallon jug on sale for about five or six bucks at Walmart and thought "how perfect, with summer just ahead." Most of the candy came from the Dollar Tree. 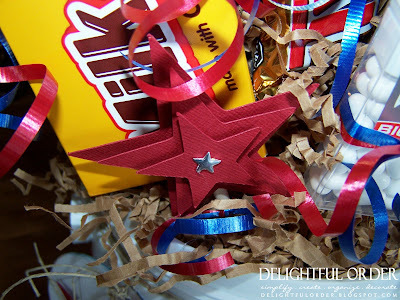 I cut out stars with my Cricut and used pop-up stickers to create the three-dimensional ones. Some of the stars are 3-D, others aren't. I just hot-glued the wooden dowels to the back of the stars. 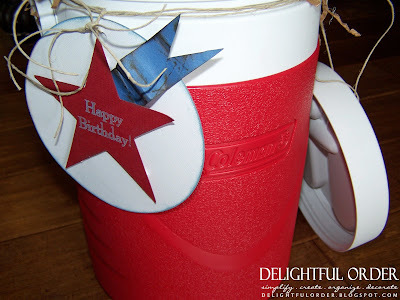 I made a quick little happy birthday tag. and hung the tag and the lid off the side of the jug with hemp. 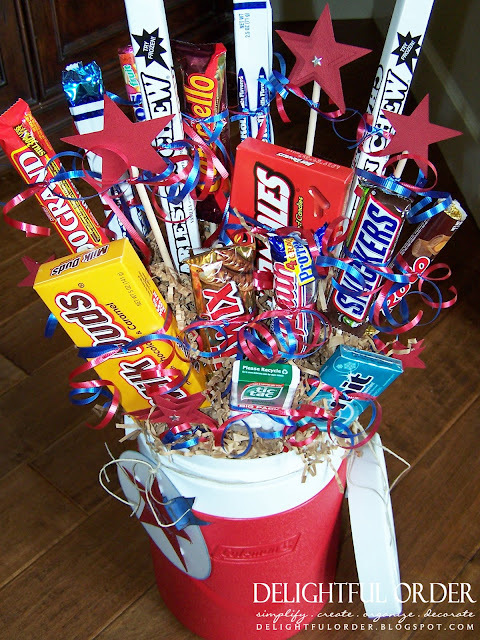 There you have it: A candy bouquet gift idea for the candy lover MAN in your life. How about you? 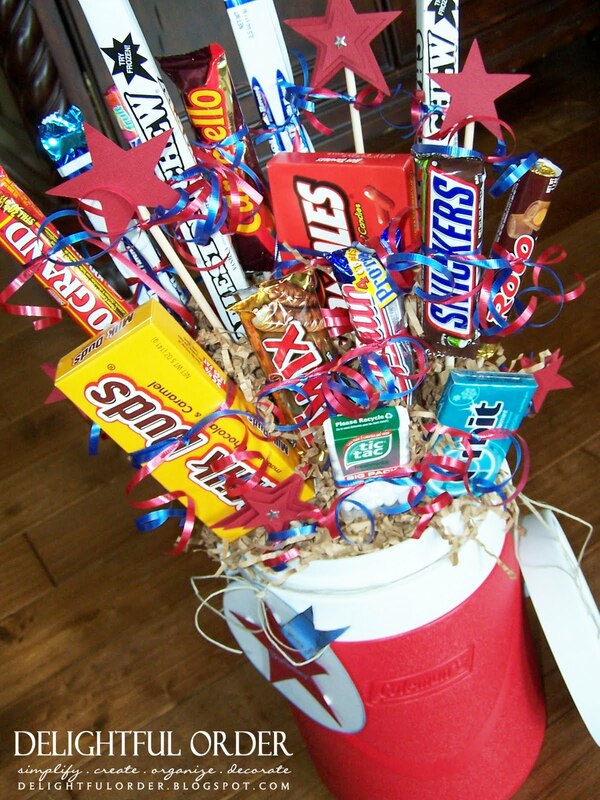 Have you created a candy bouquet? If so, what have you used for a container? and if you haven't created one of , do you plan to soon? Do share!! I'd LOVE to hear from you. This turned out so adorable! I love the thermos too and the stars. So cute! It just so happened that my son and I created three candy bouquets on Thursday. Friday was his last day of first grade and that's what we gave his two teachers and the principal. They were a huge hit! 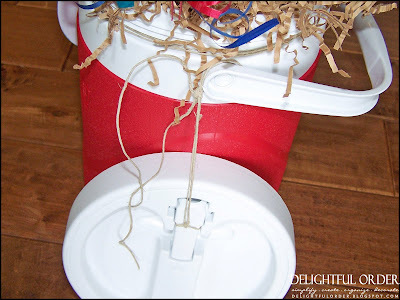 Thanks so much for sharing this idea on your blog! I love your blog! Also, my husband even told me how good they looked....which is rare that he notices things like that. So then when I just saw this post about a man "arrangement" I thought, "How perfect would this be for him for Father's Day coming up!" I'm even going with the water cooler idea. That will be perfect since he could use this out on the farm! So thanks once again for these wonderful ideas!! Great idea to change the container depending on the recipient's tastes/needs. This is a great idea for Father's Day! Great idea, what a shame my man doesn't have a sweet tooth! I'll have to find someone else to give one to. What a fun idea! That looks fantastic! 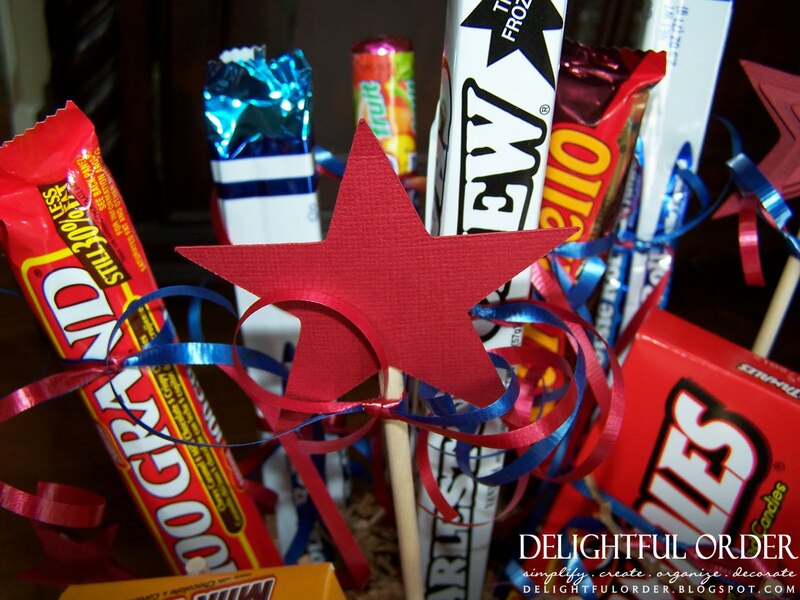 I love this candy bouquet and I think it would make a perfect Father's Day gift! I am linking to your post on my blog. Did you glue sticks to the back of the candy as well? 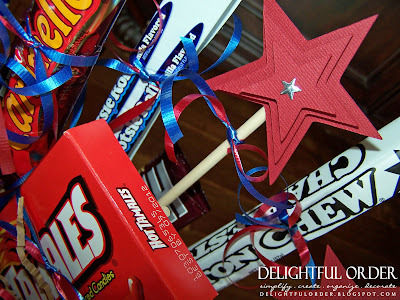 Yes the sticks are glued to the back of the candy with hot glue.